First Team Basketball Hoops from Basketball Hoops Unlimited - TETHERBALL SET - In-Ground Removable System. 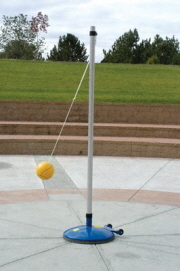 School Grade Tetherball Set by Bison, Inc. Rugged System Designed For Schools, Park Leagues, Beach Resorts, Campgrounds, YMCA's or your Backyard. Heavy duty 1-7/8" diameter galvanized steel pole with top ring. Ground sleeve is included for easy pole removal when not in use. Can also be installed directly in concrete for a permanent installation. Offical tetherball with rope and attachment ring. Need Sales Help or Installation Information? 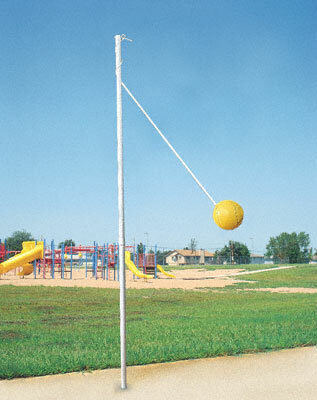 Call our Tetherball Expert toll free at 888-836-2992 7 days a week! We proudly use ABF Freight System, Inc. to ship our basketball hoops. North America's most trusted carrier, they provide our customers with Award Winning curb side service throughout the US and Canada. Lift Gate Service is provided where Free required. Shipping weight for this item: 35 lbs. School Grade Portable Tetherball Set. Indoor/Outdoor Use. Includes Ball, Rope and Top Ring.